Goodness, thank you so much for saving me from my own self with your comments following my last post. Sometimes I find if I've been working on something for a while it can become so familiar that I no longer actually see it with the benefit of distance. It was entirely helpful that so many of you left comments suggesting the designs for my next paper piecing project that I'd been working on were altogether too crowded. I left the insane star design alone completely and reworked the flower petals, but it ended up not feeling quite right, so I started afresh and kept your words in mind about the need for visual resting points and came up with the design in this post, which I feel much happier with. I think it retains some of the stained glass window feel (which is something which appeals to me), but is more suited for a small-scale fabric creation, rather than a vast church window. However, I would love your input, as it was so helpful last time. The finished piece would be around 6 times as large as it's shown here, which may add to the space and lessen the feeling of the pieces being quite so tiny (I've never been good at visually increasing scale without sitting down and doing the maths for it, so just in case I've got that wrong, it's intended to sit in a very large frame that will be around 32" x 32" above a fireplace). In this last photo I've boosted the colours a little as the natural light today is so gloomy. Although it looks garish, it gives a better idea of how jewel-like the fabrics are. I answered a few questions in the comments to the last post, but just in case you missed my responses, some commenters had asked how one goes about scanning fabrics into a computer. I scan mine in using the scanner function on my printer, however, if your printer doesn't have that facility then you can visit the fabric manufacturer's website where they will often have sample images which you can download. 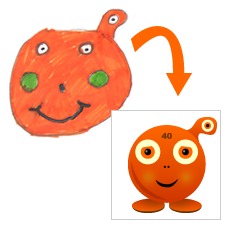 From there you'll be able to fill shapes in a variety of programmes from Word to PowerPoint to more advanced programmes such as Illustrator and Photoshop. I use Illustrator occasionally, but have tended to feel happiest using PowerPoint to mock up quilt designs - it tends to be viewed as a fairly limited programme, but over the years it's been developed hugely and its drawing tools are now fantastic and mimic many of the features found in more powerful design programmes. As it's so often installed on your machine already due to it being a component of Office for Windows it's a good starting point in deciding whether you're a computer or a pencil-and-paper sort of person when it comes to quilt design. However, for these latest designs I've been using some software called EQ7 which is built specifically for quilt design, and so simplifies many of the tasks, as well as providing you with an extensive library of traditional blocks to call upon and edit. I bought mine here and have been offered wonderful service, however, like all software it is expensive and comes with a learning curve. When I've had a chance to get used to it and explore its possibilities I'll hopefully post more about whether it feels like it's worth the investment. In the meantime, do you think I'm ready to cut into my fabrics yet? My sewing feels rather like it's been stagnating recently. Not because of any lack of enthusiasm or time spent sewing, but because the projects I've chosen to immerse myself in lately are so time-consuming and long-winded that there isn't a quick end-point to anything. However, the bits that are left for me to do on current projects are mainly either hand-quilting or machine work, which means that a window has finally opened for me to enter into another paper-piecing project to fit into my handbag for out-and-about sewing. I've long wanted to make a wall-hanging: something which I can frame, rather than lie beneath; something intricate, with tiny pieces, which replicates the enjoyment I found in piecing together the Tessellations medallion which ended up in this quilt (still being hand-quilted: too large to fit in my handbag). Last week I fitted in the time to play around designing a few quilt patterns. Once I'd put together two options which I felt I might be happy with, I scanned in my intended fabrics and dropped them into place. On printing them out, my paper became so saturated by intense colour that the print-outs above are not entirely helpful, but the screen grabs below give a clearer idea. The fabrics I've scanned in for this are some Oakshott Rubies which I picked up at the Quilt Festival over the summer. The scanner failed in its attempt to capture the bright iridescence of the fabric and makes them look so heavily woven that they take on a distinctly more earthy hue than they possess in real life, but they are perhaps more successful than the print-outs. I'm quite pleased about that though, as one doesn't want the computer-generated mock-up to be so accurate that it dissolves the impetus to actually make the design up in fabric. It's only in retrospect that I can see that I may need to go back and simplify whichever design I choose to make, unless I want another project that takes years rather than months to complete. I'm imagining the finished piece may be about 24" x 24" or a little bigger. My sister told me this morning that she was anticipating a blog post from me today as I'd been most unforthcoming on that front over recent days. This criticism is very true, but hand-quilting is a slow business, which does not yield new makes several times a week, nor does it allow any time for typing. It is greedy, both in terms of the attention it requires and in terms of physical commitment. I realised yesterday that one of my non-thimbled fingers is now so well-worn that it had become painful to type on my phone's touchscreen, so I'd subconsciously begun avoiding it (which is perhaps why I've also been absent from Twitter and Instagram). Don't take this to mean I'm not enjoying it though - I find it so addictive that it's an effort to tear myself away from it to do anything else. I still don't feel I've perfected my stitches: they are smaller on the back than the front and while I can pinpoint why this is, it doesn't seem to help me to consistently correct this. Having said this, they are for the most part pleasingly even on the front, so I'm happy to work this out over the course of the quilt and I've been stalking the videos on YouTube which reveal the hand-quilting rocking motion in glorious 3D allowing one to pinpoint the elements required for hand-quilterly perfection. As a collection of videos they reveal that every quilter achieves this in a slightly different way, with some merrily stabbing at their own bare thumb with each stitch, seemingly unflustered by the potential for bloodshed over a white quilt and reassuring their audience that spearing yourself repeatedly with the needle is just one of those things you have to accept and endure about the rocking motion. I guess it's just about finding your own idiosyncratic route to whatever produces good results. It's also opened my eyes to a number of products which appear in the course of these videos. A Clover desk needle threader has gone straight to the top of my wish list - does anyone know if they really do thread a relatively thick cotton through the tiny eye of a needle successfully? Additionally, I've seen a solid latex thimble that I'd like to try on one of my other fingers and I'm thinking more about whether my current lighting is sufficient to save me from blindness before my fortieth birthday (which is just five short years away). In Diana Boston's wonderful biography of her late mother-in-law, Lucy Boston, she shares one of her letters in which Lucy writes to a friend: possibly a friendship quilt can include old crone's sewing when you consider that I can't see:- the eye of the the needle, the thread, the edge of the material, the point of the needle, the stitch I have made and that in my agony of blindness I even sewed my dressing gown skirt into it. Reading of Lucy's life and seeing her beautiful quilts hand-pieced well into her nineties made me realise how desperately I do not wish to curtail the potential for life-long quilting fun by damaging my own sight - I tend to do most of my hand-sewing in the evenings, so any recommendations for lighting would be gratefully received. Both of my local fabric shops sell something called Purelite, which looks effective, if somewhat upsettingly clinical and as though dental treatment could be about to be administered at any moment. Some of these lights comes with built-in magnifying glasses - I don't know enough about vision to know if using a magnifying glass unnecessarily over long periods could actually weaken eyes, rather than relieve the strain on them or how easy it is to actually spend your entire time peering through a lens? The Patchworks of Lucy Boston , by the way, was a book recommended to me by Vivienne in the comments to one of my posts several months ago and it's a book with which I've fallen utterly in love. Not only does it contain photos of Lucy's stunning work, but it left me with a great fondness for Lucy as a person and a quilter and she is often in my thoughts when I'm hand-sewing. If it isn't a book which you own, I'd recommend it hugely - it's a warm patchwork of photos, letters, construction methods, Lucy's practises for fabric acquisition and how her quilts were patched and repatched to extend their lives. It's quite unlike any other quilting book I've come across. Oh, and just in case you're interested in seeing the back of the quilt, I've included a photo of it above. All that is left to quilt are the large side and top panels of plain white border fabric...which sounds as though I am on the precipice of completion, but no. My plan is for these borders to be so densely quilted that my fingers may well be only tiny stumps by the time I've finished. Stark white fabric can quickly look grubby (most especially when one recklessly wears a black jumper which leaves tiny flecks of lint all over it) and I've noticed that the areas with dense quilting seem to suddenly look very neat and finished and not at all like their unquilted counterparts. After learning English paper piecing at the start of the year, I'm finding there are yet more hand-sewing skills to be practised and fallen in love with. I decided to hand-quilt my daughter's Liberty print quilt and, other than hand-stitching a few flower emblems on my mother's silk quilt, it's not an area in which I've dabbled before. When it comes to hand-sewing, the learning of each new skill feels like being returned to square one as a sewing novice once more and it's a feeling which I love. Perhaps because it's an uncertainty that's wrapped up in some confidence - in most others areas of life where I may give up too quickly and never see the outcome of persevering, when it comes to sewing I have a concrete belief that if I keep going I really will somehow improve. So for several hours I kept this faith at the forefront of my mind: when my sewing was awkward and the effort of wielding the needle clumsily through the fabric felt something akin to sewing with a pitchfork; when the hoop seemed unwieldy and I failed to find a way to easily rest it in the crook of my arm; when my shoulders ached through my poor sewing position; and when I forced myself to unpick previous lines of stitching every time I saw my more recent stitches becoming neater. I spent hours striving for the elusive rocking motion that the lovely Ruth Eglinton had told me about when I'd met her at the Festival of Quilts and frequently reminded myself of my book's words: Initially, it's more important for the stitches to be an even, regular size than for them to small. And finally, after several hours, I remembered someone telling me that hand-quilting is easier if you sew toward your body - and it was this which made the difference. Suddenly the rocking motion appeared, my shoulders felt more relaxed, my stitches more even, my fingers beneath the quilt rocking the fabric up and down to meet the needle at just the right time to allow a few stitches at a time to slip painlessly onto the needle. And once the rhythm had been felt, I realised that I could sew away from my body with just as much ease. For the central square I am following the lines of the large hand-pieced medallion. When, at first, the stitches hug the edge of this motif they are the clear outline of the flower, but as they radiate out toward the edges of the square they begin to look like indistinct undulating waves of stitching which remind me of the whirls of a finger print. They are not tiny and perfect like Ruth's stitches which I aspire to but they are, for the most part, even. I hadn't realised how pleasingly different hand quilting would feel to machine quilting. But it is deliciously tactile. When I run my hand over this dense hand-quilting it feels soft and smooth, but simultaneously, bumpy and puffy. It has a confusing, enjoyable feel that leaves my hand wandering back for more smoothing and stroking of the fabric. My daughter came and sat with me last night while I quilted and from the moment that she touched a finished area she too seemed drawn to sit and run her hands over it, admiring its bobbly softness. My fingers feel slightly painful, from trial and error as I experimented with thimble use and which fingers it was best to wear them on. I have something of a selection. The lovely tan leather thimble delights me with its softness, good quality and the feeling that it could become a well-worn friend but, on a quilt with a lot of white fabric, the tiny flecks of leather it leaves behind are an irritation. The most comfortable and practical thimble has been the one which Ruth advised me to buy - it has a strange stretchy latexy sleeve which fits to your finger snuggly and the tip has a ridge to stop the needle shooting off the sides. I am also enjoying using my needle catcher (the cream flat disc) on the rare occassions when I've found I've loaded too many stitches onto my needle and it's difficult to pull through the fabric. 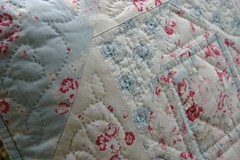 The thing which I've been most surprised by though is how much more well-basted one's quilt must be for hand-quilting. I've always felt that the one area of quilting in which I excel is preparing a smooth quilt sandwich which stays in wrinkle-free and smooth throughout the quilting process. However, hand-quilting has wiped away any feelings of self-assurance in that department. Frequently placing the quilt in and out of the hoop and repeatedly stretching different areas of it taut means that the quilt needs to be basted together much more firmly at the outset with pins placed more closely and perhaps a more generous attack with the basting spray! This is such a learning curve. During the day I have been writing up my Dresden plates messenger bag patten, but I am finding that often I have a flip-floppy stomach feeling of excitement whenever I think of the evening where I can sit hand-stitching while watching past episodes of the Great British Bake-Off on iPlayer (my husband is out for a few hours several evenings a week as he has numerous sporting commitments, but I am slowly drawing him into this as he invariably arrives home mid-episode). What tips do you have for hand-quilting? Do you have a favourite book or tutorial, a beloved tool, a way of marking out quilting lines or a unique stitching method which ensures perfect stitches? I would love to hear. Things have been rather busy over the last week, so this blog post comes to you in bullet-pointed form to streamline my thinking and because linking up all the fragments into a cohesive post may be too arduous a task for the time in which I have to write this. Spending the evenings teaching myself how to piece hexagons and diamonds by machine, something I've always feared but now feel I've conquered, whilst my husband has read to us from Lauren St John's brilliant The One Dollar Horse - one of my daughter's birthday gifts. I'd initially started using the English paper piecing method to assemble the rows of hexagons and diamonds, but I quickly realised that I don't enjoy piecing larger shapes by hand and it would have taken forever to finish the quilt that I'm already desperate to begin using. Ripping up the carpet in our bedroom with the help of my rotary cutter (I'm not sure it's intended for materials quite that heavy-duty, but it did a super job!) after all your suggestions that it would help with my allergies. I'm happy to report that I think it has made something of a difference. After some friends helped us pick a rug one evening, we decided that I should not accessorise the entire house in shades of red and chose to lay something neutral over the boards and plan on getting them properly sanded and stained when funds permit. In the meantime, I've filled in some of the holes beneath my desk with foil as I feel distressed by the idea of losing one of my sewing machine feet or the bobbin case down there. My husband says this makes it look like a rather blingy sort of floor: the equivalent of a golden tooth in a mouth full of natural white. We also unearthed this very sweet scrawl in the hearth which had been filled in with concrete - we were so disappointed she hadn't marked down the year though. We have long term plans to remove the concrete, lay something lovely and reinstall a mantle piece from a salvage yard but, for now, I'm quite happy seeing this bit of childish irreverence each morning. We have been replacing the broken chests from Ikea which I stored much of my sewing paraphernalia in and which made me sneeze every time I opened the drawers (apparently the exposed chipboard where they'd broken would have contained formaldehyde which is meant to be super-allergenic). I am quite in love with the flame mahogany drawers which we found in a local antiques shop - they smell delicious, don't make me sneeze and will hopefully last longer than three years. I have been writing up the bag pattern for the messenger bag mentioned in the last post - thanks to your feedback it will include an option for making it with the Dresden plates. My first sample is being made with Denyse Schmidt's Chicopee corduroy - my daughter adores this and has already claimed it as a weekend bag. I have been helping my husband sort through the wonderful entries for the Design a Squeeble competition and picking the winners who will have their Squeeble brought to life in digital form to feature in future apps. We've run this competition twice now and it's always a really happy process to look through them all and to see what the children have written and imagined for their character - neither of us are natural judges though - we both become completely pained by having to reject some of the wonderful drawings to pick out a winner. I have been pondering whether to go to the Knitting and Stitching show at Alexandra Palace that's running the week after next. Last year I made a bee-line for The Silk Route to gather fabrics for my mother's quilt and I'm tempted by visiting them again. Other draws are the presence of The Village Haberdashery, Sunflower fabrics and Fabrics Galore with their double-stand loveliness, both of whom stock an abundance of Liberty prints. I had been desperately hoping Quilt Mania might make an appearance, but sadly their name is not on the list of exhibitors. Wondering if it's possible to successfully dye leather - I've seen my dream boots, but the colour is less dreamy. Enjoying watching my daughter take charge of birthday cakes for both grandmothers' birthdays. Admiring my little boy's sudden desire to perfect his handwriting and working through this simple book together. Finishing Parade's End on iPlayer - it wasn't the best of series, but was worth watching just because it was so beautifully shot. Putting away my summer clothes and enjoying reacquainting myself with old winter favourites. Generally getting things done. The shiny-new-pencil-case feeling which eluded me in September has made a welcome guest appearance for October. Finally, I am swooning over the range of boiled wools which Dorte has recently got in at Dragonfly Fabrics. There's a stunning range of colours (including many shades of blue!). They would be perfect for a winter jacket, perhaps something like this one which I made a few years ago. Bullet-pointed lists in the comments of your own goings-on are most welcome.